As we get older, our bodies undergo various physiological and physical changes, which can affect our heart rhythm. The sensation of a racing heart, especially when experienced for the first time, can be very scary and unpleasant. Understanding the underlying causes of rapid heartbeat, medically known as tachycardia, can provide you with peace and comfort, as well as help you create a management plan for this condition. 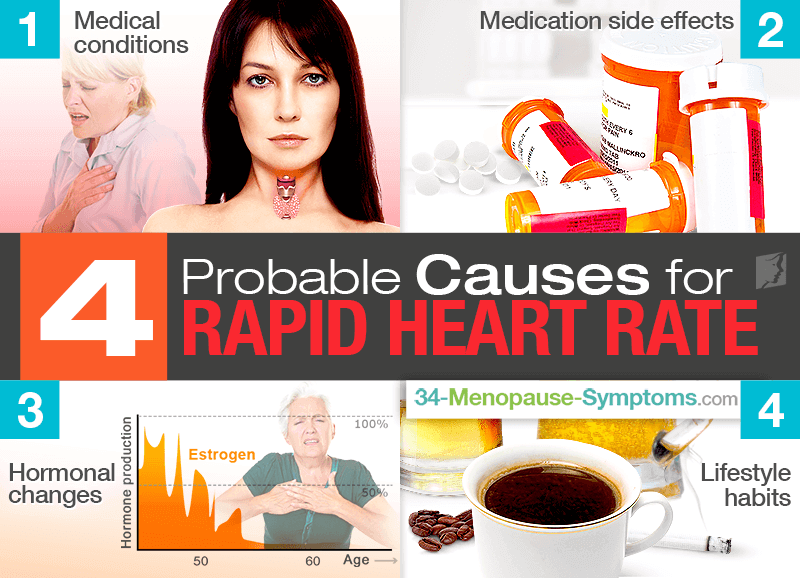 Read more about what causes a rapid heart rate. Regular heart beat varies from person to person, but the accepted range is between 60-100 beats per minute. The pulse should be taken at rest, preferably sitting down and in a relaxed state, to ensure the accurate reading. Heart disease. Various heart illnesses, such atrial fibrillation or supra ventricular tachycardia, affect the heart by disrupting its electrical signals and often damaging its tissues. Anemia. An untreated iron-deficiency can lead to certain heart dysfunctions and even a heart failure. Hyperthyroidism, which is five to 10 times more common in women, occurs when thyroid hormones, T3 and T4 are abnormally high. This imbalance affects the whole metabolism, often resulting in a racing heart. Fever. This symptom common in acute infections, when your body is fighting off pathogens, can indirectly lead to an increased heart rate. Dehydration. Insufficient fluid intake and electrolyte imbalance cause a decrease in blood pressure, for which the heart tries to compensate by increasing its rate of contractions. Anxiety. Caused by difficult life events, such as divorce or death of a family member, cause a release of higher amounts of adrenaline and cortisol, which in turn speed up the heart rate. Some medications, for example, those used to treat hypothyroidism or asthma, are known to have a side effects of a rapid heartbeat. An incorrect dose might also be a contributing factor. Changes in estrogen levels during menopause overstimulate the sympathetic autonomic nervous system, often leading to a rapid or irregular heartbeat. Overconsumption of certain stimulants, such as caffeine, as well as smoking, alcohol, and illegal drugs may trigger tachycardia. The causes of a rapid heartbeat are numerous. Sometimes, it is related to mineral deficiencies or acute infection, whereas other times, it requires a more complex treatment plan. Regardless of its origin, tachycardia should not be ignored. It is important to pay attention to any changes in your body, especially during menopause, and seek medical help to rule out possible life-threatening conditions. To take a good care of your heart, check out the best natural ways to cure irregular heartbeat. Longo, D.L., Fauci, A.S., Kasper, D.L., Hauser, S.L., Jameson, J.L., Loscalzo, J. (n.d.). Harrison's Principles of Internal Medicine, 18e. Chapter 233: The Tachyarrhythmias. Available from McGraw-Hill Medical Library. Everyone experiences irregular heartbeats from time to time, especially during menopause. Learn here about five habits and triggers to avoid. There are several factors that can cause arrhythmias. Click here to learn about what causes irregular heartbeat for improved heart health.